The open system standard MicroTCA.4 targets mid- and high performance applications requiring longevity, flexibility and scalability. For example MicroTCA.4 systems can be found in large installations of hundreds of systems, where signal quality, precise triggering, maintenance, upgradability and uptime are key requirements. Especially applications, which are installed far away or without direct access, are benefitting from the rich remote support functionality which is independent of and autonomous from the running applications. In MicroTCA.4 systems incorporating high performance FPGAs, data transfers between the FPGAs and the CPU are optimized by letting the FPGAs perform their data transfers via DMA to the memory of the local CPU. For these applications bandwidth between the FPGAs and the CPU are key and lacking bandwidth as with current CPUs and their 32Gbps data path can easily create a serious bottleneck. 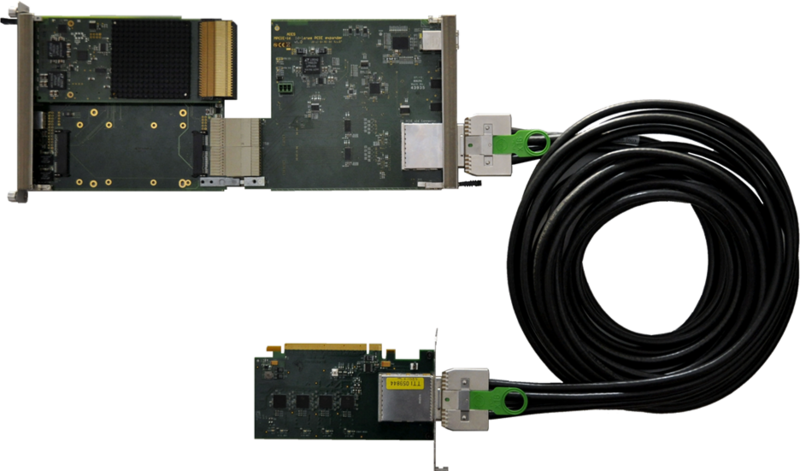 128Gbps PCIe bandwidth as provided by the NAT-MCH-PHYS80 and its extension NAT-MCH-RTM-RF-COMex-i7 overcome this situation and provide sufficient bandwidth for future applications. 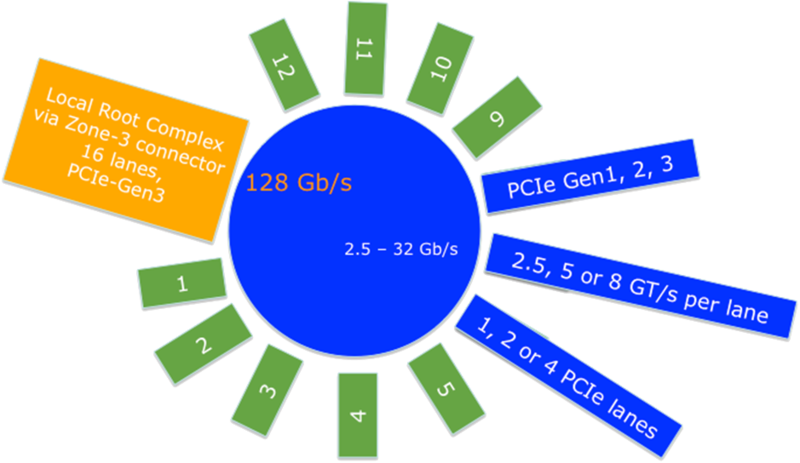 If twelve AMC slots for PCIexpress-IO are not enough, the NAT-MCH-PHYS80 can be equipped with optical PCIexpress uplinks allowing cascading of multiple MicroTCA.4 systems. Two x8 lane PCIexpress Gen3 (each 64Gbps) uplinks to cascade two additional MicroTCA.4 systems (36 PCIexpress slots). Each chassis can uplink to further MicroTCA.4 systems, thus adding multiples of 12 slots. 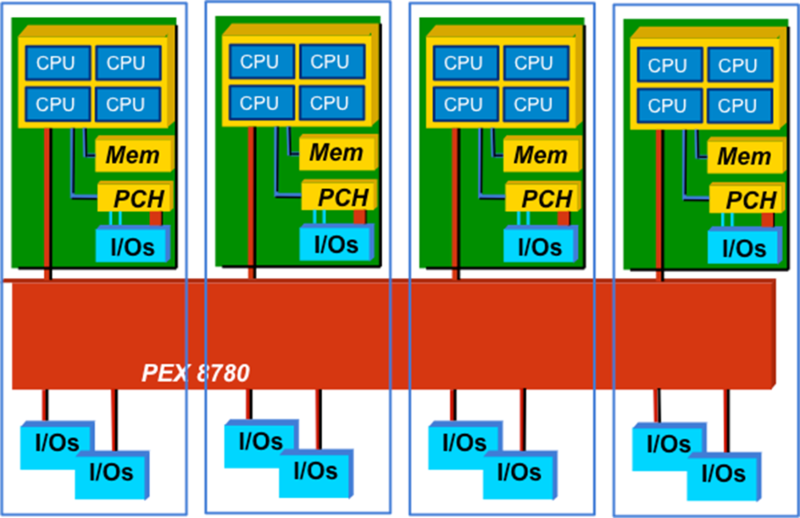 If not the number of IO slots is of concern, but the overall processing power, the optical uplinks can be used to interconnect an external high performance computer to the MicroTCA.4 system, acting as the PCIexpress root complex. For this kind of application the NAT-MCH-PHYS80 extension NAT-MCH-RTM-PCIEx16-OPTICAL-UPLNK is needed for the MicroTCA.4 system and the NPCIEx16-Uplink is needed for the external high performance computer. 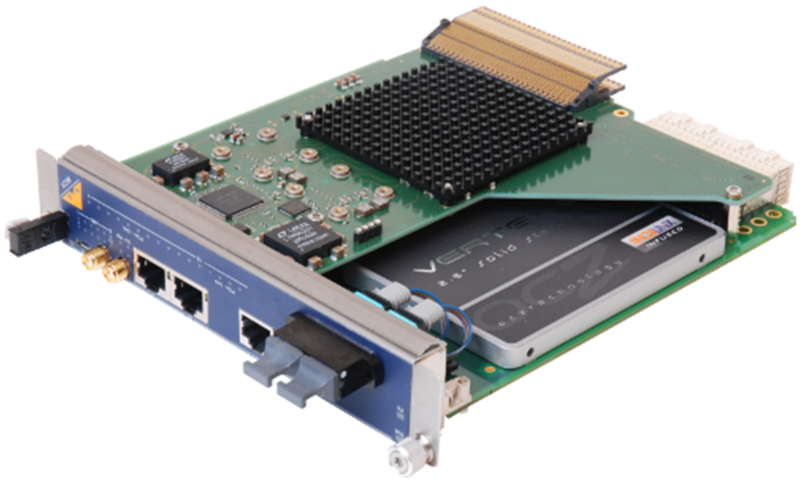 The NPCIEx16-Uplnk is a PCIexpress card with 16 PCIexpress Gen3 lanes to the external high performance PC and a 16 lane PCIexpress Gen3 optical interface to the NAT-MCH-PHYS80. 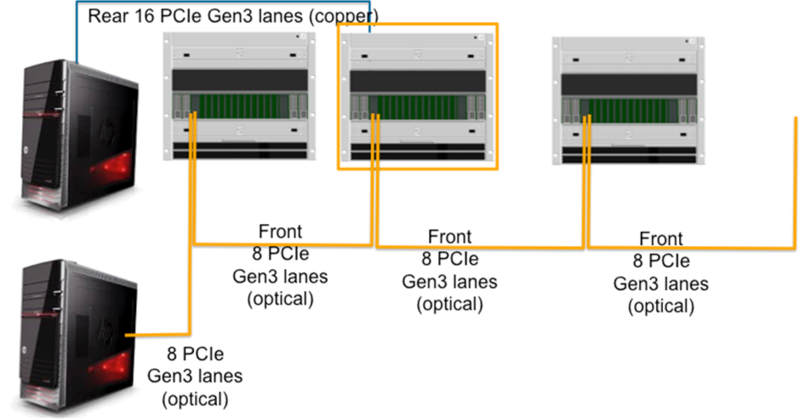 Alternatively the NPCIEx16-UPLNK can be used to facilitate two x8 lane PCIexpress-Gen3 connections to two MicroTCA.4 systems. The NAT-MCH-PHYS80 can be equipped with an optical x16 PCIexpress uplink at the front panel and with the rear transition module NAT-MCH-RTM-PCIEx16-UPLNK offering a x16 copper PCIexpress Gen3 lane on the rear side. Dependent on the requirements either the front or the rear PCIexpress uplink can be used for external CPU processing power and the remaining one for PCIexpress IO extension. Also both PCIexpress uplinks can be used for external CPU processing power, if the PCIexpress Cluster mode of the NAT-MCH-PHYS80 is used. The NAT-MCH-PHYS80 allows flexible configuration of up to 6 PCIexpress root complexes (CPU) and a combination of PCIexpress-IO boards assigned to them. In this configuration which is also known as “PCIexpress Virtual Switching”, it does not matter, whether the CPUs are realized by AMCs or MCH-RTM-CORE-i7 or connected to the system via PCIexpress uplinks. The NAT-MCH-PHYS80 fully supports redundant management and power environments. Frequent exchange of the internal databases with the secondary MCH and a heart beat mechanism ensure an immediate switch-over from the primary to the secondary MCH whenever it becomes necessary (PCIe fat pipe switch over require additional precautions). The NAT-MCH-PHYS80 can handle up to four power modules (i.e. NAT-PM-DC840 or NAT-PM-AC600, NAT-PM-AC600D, 1000 WATT AC power modules) for N+1 configurations. Apart from the JAVA GUI NATview the NAT-MCH-PHYS80 also supports external management solutions which are based on the Remote Management Control Protocol (RMCP) i.e. the open-source IPMItool. Furthermore, using the NAT-MIB the NAT-MCH-PHYS80 can also be integrated into environments based on the Simple Network Management Protocol (SNMP). The NAT-MCH-PHYS80 can be configured using either upload able text based script files or through the integrated WEB interfaces using a standard web browser. Finally, the integrated debug and configuration facilities can be accessed via a serial console or using Telnet. Customers registering for the firmware update service are automatically notified by e-mail when a new firmware version becomes available. N.A.T. offers a single-width NAT-MCH with PCIe, SRIO (RapidIO), XAUI, GbE, USB, JTAG-Switch in MicroTCA.0, MicroTCA.1 and MicroTCA.4 chassis. The double-width NAT-MCH-PHYS and its NAT-MCH-RTM-COMex-i7 offer a cost optimized single slot computing, storage, switching and management solutions for MicroTCA.4 systems. The new double-width NAT-MCH-PHYS80 together with its complete set of extensions addresses the demand for high bandwidth, maximized computing and PCIexpress-IO expansion in MicroTCA.4 installations. The extensions can be added at any time, means also if your solution is already deployed to the field. Beside the rich set of MCHs (MicroTCA Carrier Hubs) N.A.T. delivers power modules, CPU, DSP, IO and carrier boards for PMCs including chassis for MTCA.0, .1 and .4. The AMC extension boards and the MMC reference boards help developers to design their own AMC and RTM cards for MicroTCA.0, .1 and .4 systems. All MTCA and AMC products from N.A.T. come with easy to use configuration software and service tools. You are looking for high performance in small footprint and for low budget and you cannot find a proper solution in Box-PC or small form factor boards, watch out for NATIVE-mini with eMCH (embedded MCH), which will be launched at Embedded World 2015, Nuremberg (Germany) and also shown at Mobile World Congress, Barcelona (Spain).